The estate sale to end all estate sales is underway. Shellendrak Manor's original construction has been condemned, and it's being rebuilt brick by brick (or TLX wall by TLX wall, as the case may be). 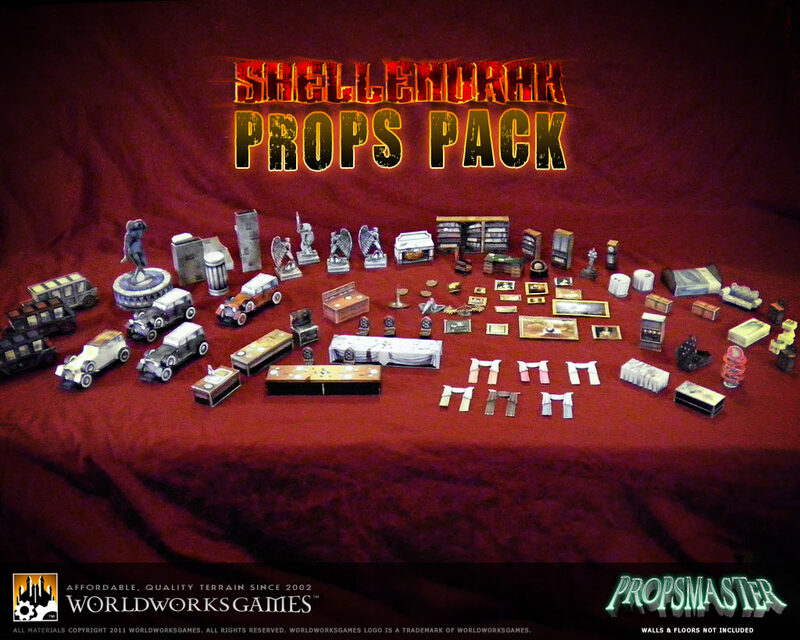 In the meantime, we've packaged up all of the props from the set, added a little bit here and there, made some adjustements to make it work for the TLX system, and are offering up the first of the Shellendrak conversions: Shellendrak Props Pack. YES! I can't wait to see the props and the set in all its Tlx glory! New Rippers lodge here I come!!! 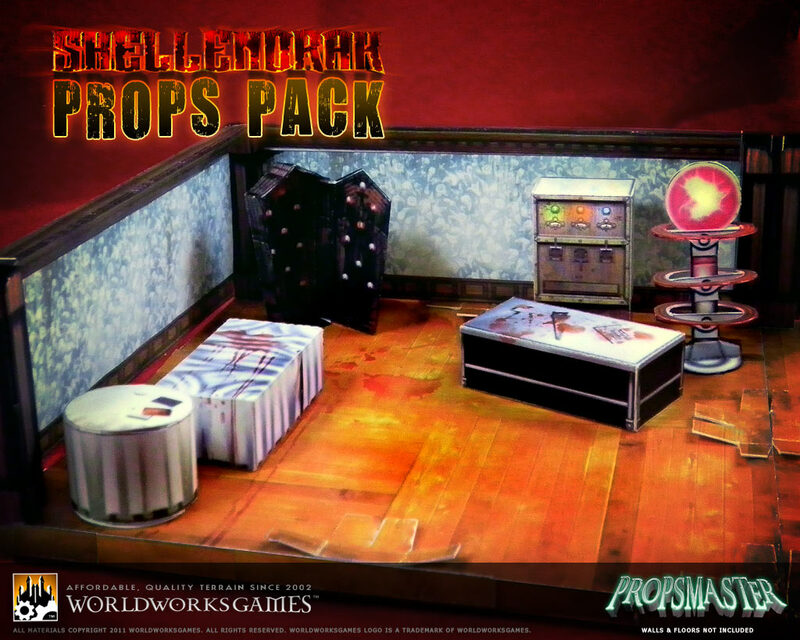 I hope this is the start of a very long line of prop packs. Of all the WWG sets I have, Shellendrak Manor is still my favourite. 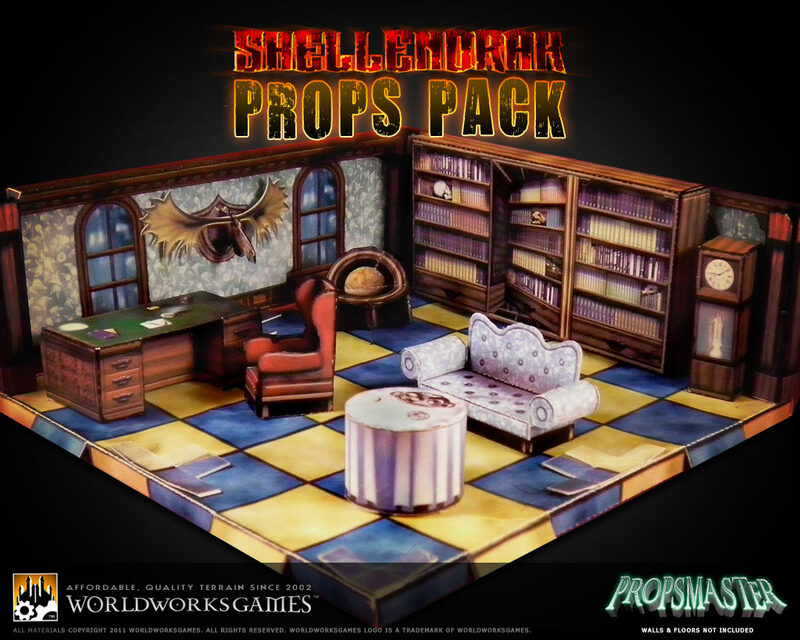 An updated props pack is a great idea. Colour me interested! 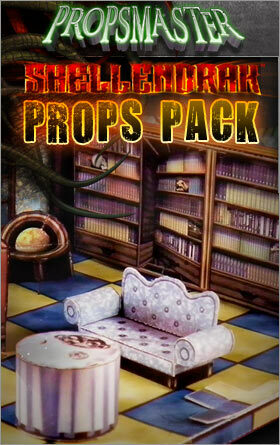 Props packs have been highly requested and will be much appreciated. I loves me some props! Yes! 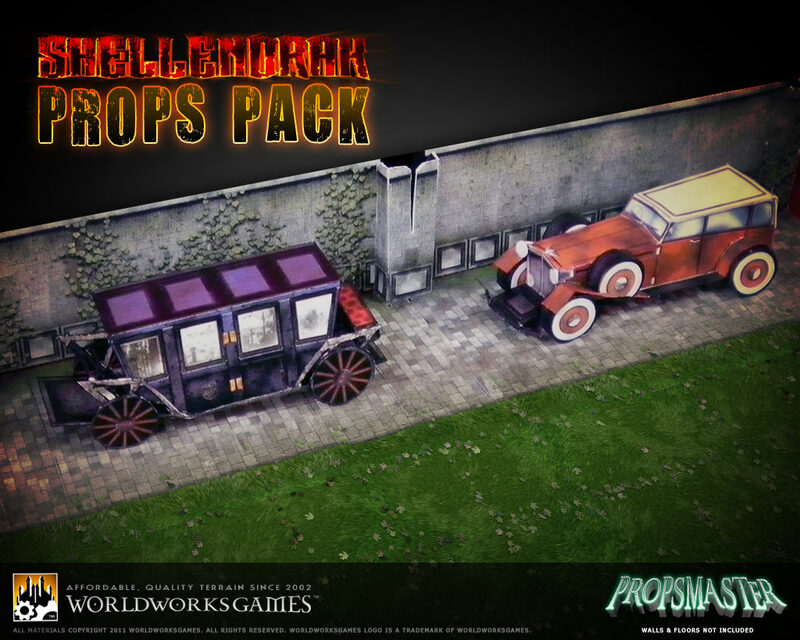 Finally we get prop packs! hopefully the first of many! Awesome! And check out that teaser for Shellendrak TLX! The curtains are designed to be semi-modular. There's little tabs at the top of them. Cut slots into the underside of the anti-warp ledge, and slip the curtain of your choice into them. New color variations are available as well. 2. How are the wall combinations going to be handled in the TLX version? To see prop style, I would check out the original set. It is more "Resident Evil" than "Magic Library," but it wouldn't be completely out of place. The look of Shellendrak Manor is, roughly, victorian. Some of the pieces will look very much at home in a Thoumont's build, others might look a bit out of place. Scale-wise, it should be a perfect fit (and some elements of Shellendrak/Thoumonts will mix and match as well). As more previews come out, you'll be able to get a good look at what all is included. 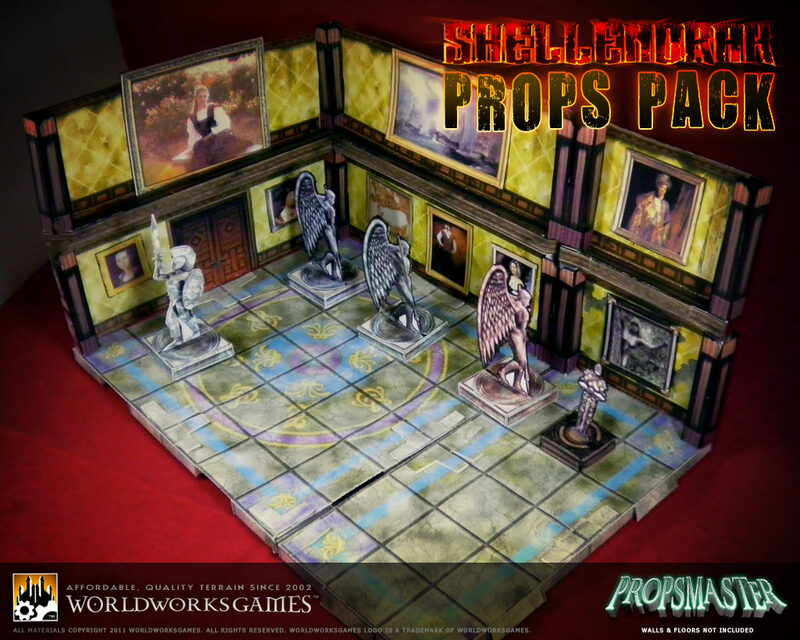 As for the wall combinations...the whole of Shellendrak itself (all the tiles, walls, roofs) from both the original and the expansion pack (Return to Shellendrak Manor) are being divided up into two equal TLX conversions...the West Wing and the East Wing. West Wing previews will be coming soon. The exterior and multiple interior textures of the west wing will cover every possible logical combination, and then the same for the East Wing when it comes out further down the line. Does that explain it well enough? Bob, you're killing me. If I stopped buying today I'd never be able to build everything I want to. Now you're releasing not 1 but 2 Shellendrak sets? Aaargh! Here! Here's my paycheck! Just take it!!! man... really psycked to see this horror stuff go linx! crossing my fingers for the cathedrae and the graveyard... thos sets look fantastic but as a linx owner i hvent been able to see buying a non linx set yet.... but once these convert i am sold. 1) You're never going to build everything you want to. If you ever did, we haven't done OUR jobs to give you a never-ending supply of "more want". 2) It's better to hear you guys complaining about too many releases too quickly than to hear you complain about too few releases too far apart. It goes along with the old minature gamers quote. "The minute you have painted all your lead you die!" Yes I know they aren't lead anymore but you get the point. Some people say I kitbash, this is incorrect since I am male and genetically incapable of reading instructions. I cut, score, and fold until it fits together, the only way the author could have intended it. Right? I wish I had time to build just the stuff I printed! I've got a stack 8"-12" or more high of prints I've just written off as never going to be built. And several other piles of things I should be working on. Seeing as how I still have the old unpainted lead, It holds very true for me still. Nice work!. ...Only one thing... I would like an option of disable the black areas when print.. or a version witouth them.. i´ve seen this yet in other model set webs... it would be good for save ink. So I shouldn't snort the powder filed off old Grenadier minis? But Ral Partha '79 was such a good year! 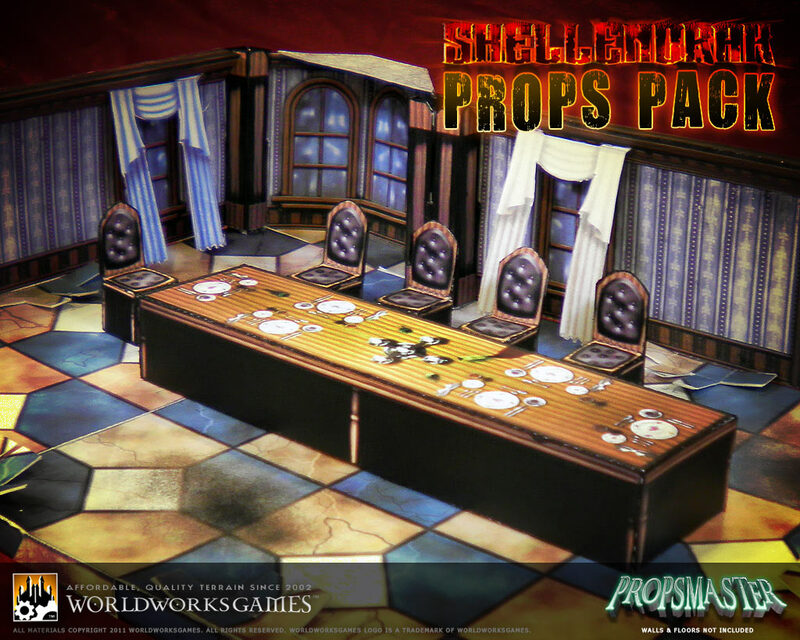 Quick question: are these mostly going to be the same props as in the old Shellendrak sets, or have they been improved or changed? If I have the old set, will I find new goodness in the new set? Mostly, they're the same. There's a few small changes, and it combines both the original Shellendrak and Return To, but the bulk of it is pulled from those two sets. ...and rearranged on the pages for full GSD support. Phew!!! I thought I was the only wierdo who thought that!!! I have a huge crate of minis in progress! Half painted scantilly clad barbarian chicks everywhere. Each release from WWG keeps them forever in backburner limbo. Honest to goodness, more pictures will be coming soon. More teasers from Shellendrak props! Love the moosehead on the wall, and the statues could be useful in many fantasy games as well.